Some of the owner’s fondest memories are framed with Florida Gulf Coast family vacations. So when he and his wife were looking to shift their permanent residence from Wisconsin, choosing Florida’s west coast was a breeze. 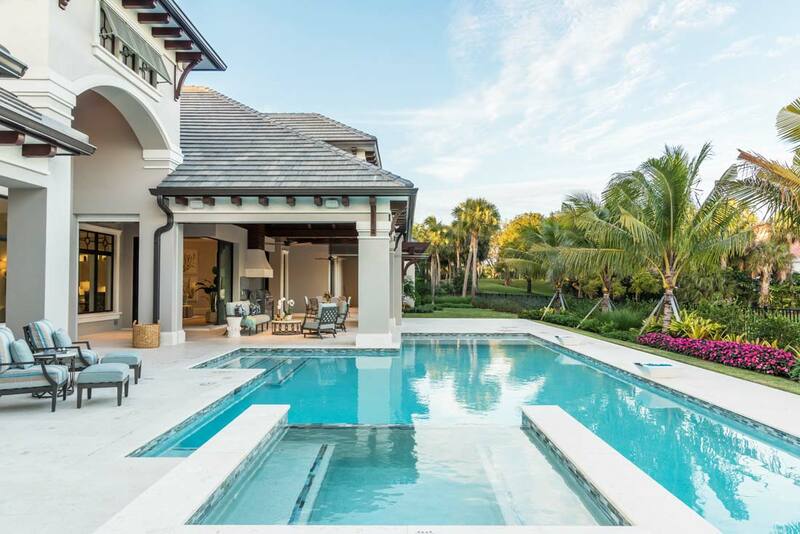 Built on one of the last remaining lots inside the exclusive Bay Colony in Naples, the owners wanted the 6,200-square-foot home to look and feel like it belonged in Florida. To find the perfect harmony in their vision — a balance of classic, timeless design with comfortable, coastal interiors — the couple teamed up with interior designer Sally Richardson. The homeowners wanted interesting pieces with attention paid to all the details, and so with nearly 20 years in the business, an artistic background and a love for color, Richardson knew this would be a fun collaboration from the start. COVER PHOTO: A balance of classic and timeless design styles this 6,200-square-foot house nestled in lush tropical foliage and gardens by Architectural Land Design. This home also features a one-bedroom guest cabana with its own kitchen and bath. ABOVE: “We didn’t want an ordinary fixture in such a grand entrance… it needed to be fun and unexpected,” interior designer Sally Richardson says of the custom chandelier designed by V art glass. Global Views driftwood chests and mirrors with a gessoed finish in matte white complete the welcoming space. 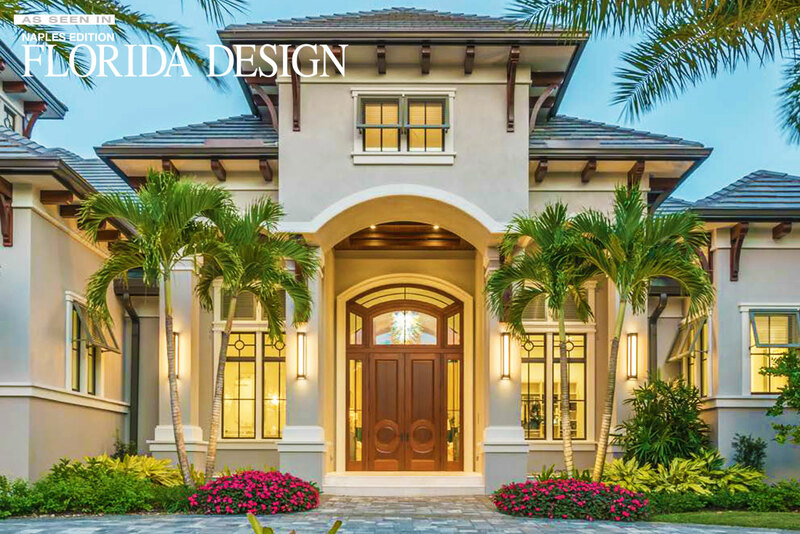 Inviting with landscape that reflects Florida’s native species, the home is designed with a classic exterior accentuated with beautiful trim details in a modern palette of gray tones and a rich mahogany entry door. 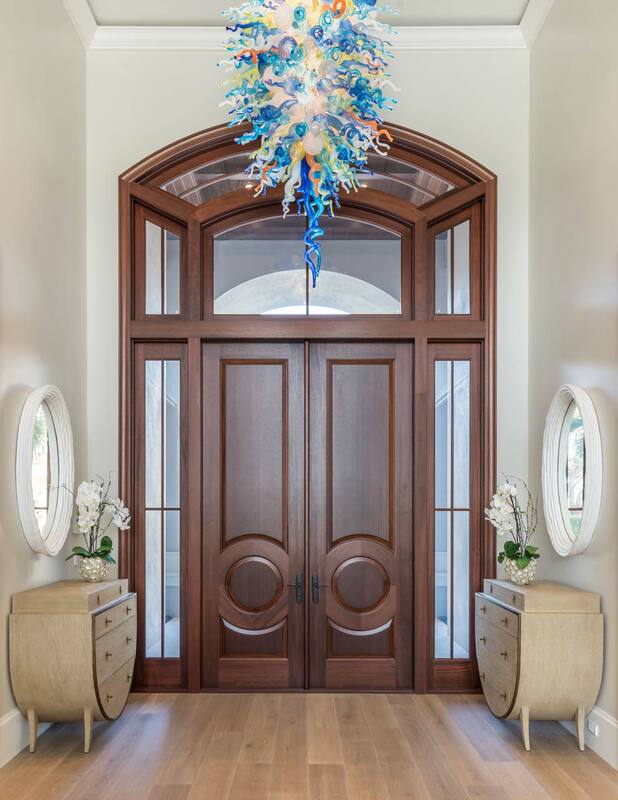 Step inside, where a vibrant glass chandelier immediately captivates in an expansive foyer. 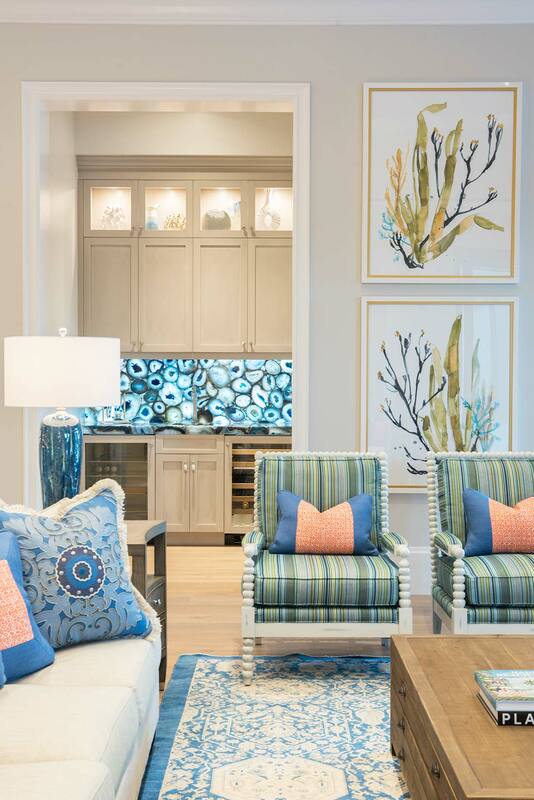 As an unveiling to the home’s coastal color palette, the glass fixture radiates rich cobalt blues and greens blended with orange, aqua and chartreuse. White European oak flooring leads the way to the great room, where a 25-foot-high ceiling and a spacious floor plan encompasses not only the family room but the adjacent dining area and kitchen as well. To collectively elevate the home’s blue and white interior palette, colorful Reef Illusion botanical prints and a white-framed, blue aquatic mural dot the warm gray walls. Hand-thrown pottery lamps, along with Manuel Canovas accent pillows and the one-of-a-kind hand-knotted area rug bring the cobalt blue hues further into the space. As puzzle aficionados, the owners specifically chose the distressed solid pine Restoration Hardware cocktail table for its slender drawers, which perfectly hold their incomplete masterpieces. ABOVE: “When we saw the agate, it was love at first sight and we knew it deserved a special place of its own,” says the designer in reference to the custom wet bar topped in stunning blue Antolini Italian agate. Nearby, Richardson pairs Vanguard Furniture sofas with Miles Talbott spool chairs to create a comfortable resort-style living area. As the heart of the home, the cool white kitchen is a favorite gathering place for the owners, who love to cook for family and friends. Casual in nature, leather-clad counter stools from Jessica Charles pull up to a workable and enjoyable spot for both chefs and onlookers. ABOVE: To balance the kitchen island’s natural calcite, Richardson chose UMI’s Pompeii Quartz Vanilla Ice countertops and a backsplash of classic white subway tile. A custom bronze and copper range hood anchors the space. 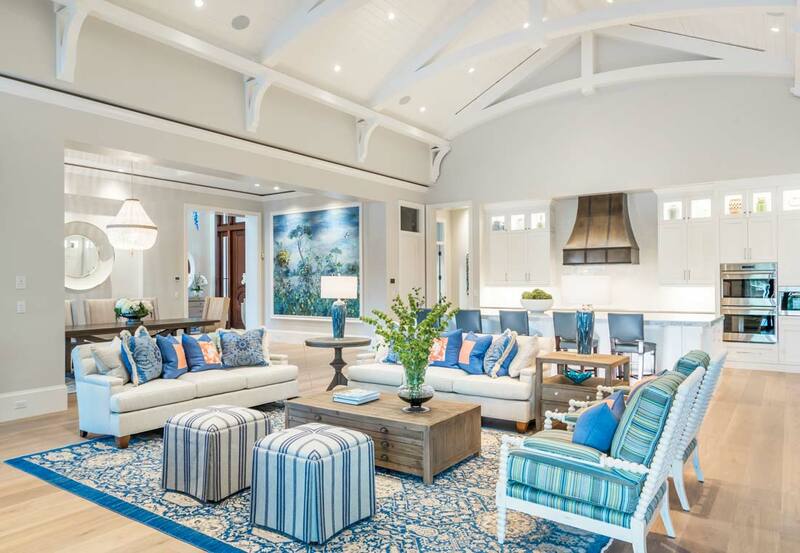 To bring the tropical landscape and airy coastal vibe into the living room, Richardson, inspired by beach towels, created fanciful peacock blue and cream color drapes in silk to balance the formality. Two Audubon prints of a flamingo and heron are colorized to match the coral color of the hand-knotted Turkish ikat motif area rug and the iridescent blue accents. ABOVE: In the living room, Burton James sofas in cream bouclé pair with Century’s whitewashed fretwork chairs adorned with an island inspired print – a perfect balance of classic and charming. Palm-inspired light fixtures from Visual Comfort add a dash of seaside whimsy. Blue hues continue in the dining area with rich embroidered Thibaut textiles that back Highland House chairs lining the European white oak trestle table. In a nod to the beach, the designer makes the room’s centerpiece a stunning Ro Sham Beaux chandelier with more than 1,000 white jade beads circled by rings of natural hemp. “I felt that using pops of white throughout the home heightened the colors,” interior designer Sally Richardson says. 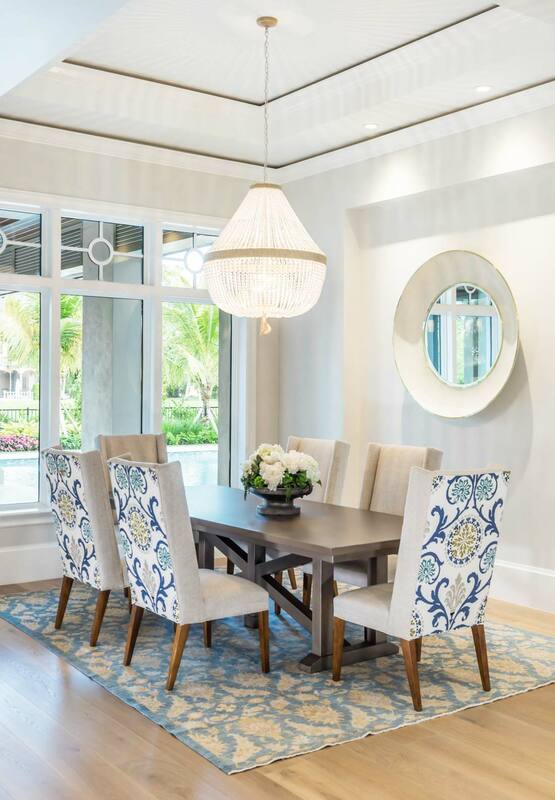 White shagreen mirrors with brass detailing offer a touch of texture in the dining area, where Old Biscayne Designs’ trestle table seats large and small gatherings. ABOVE: In the master bath, a Currey & Company frosted chandelier resembles sea glass while an inset area rug of waterjet cut blazing star tile continues the theme below. As a couple who loves to sleep in, the homeowners wanted a serene bedroom to enjoy with their two Pekingese-Papillon pups. CR Laine lounge chairs swivel to enjoy views of the pool. The Suzani tribal motif of the hand-knotted cream and blue area rug finishes the room. 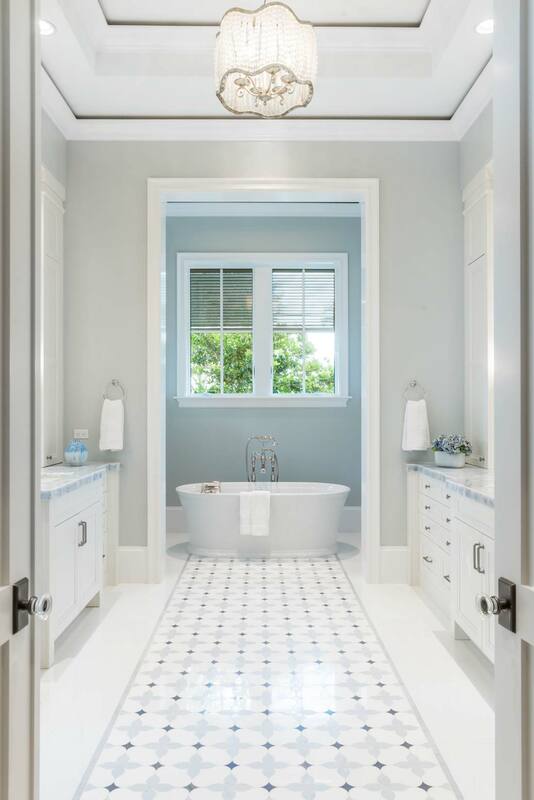 Tranquility continues in the master bath, where a striking Kohler tub, dual sinks and azul calcite countertops echo the water theme. 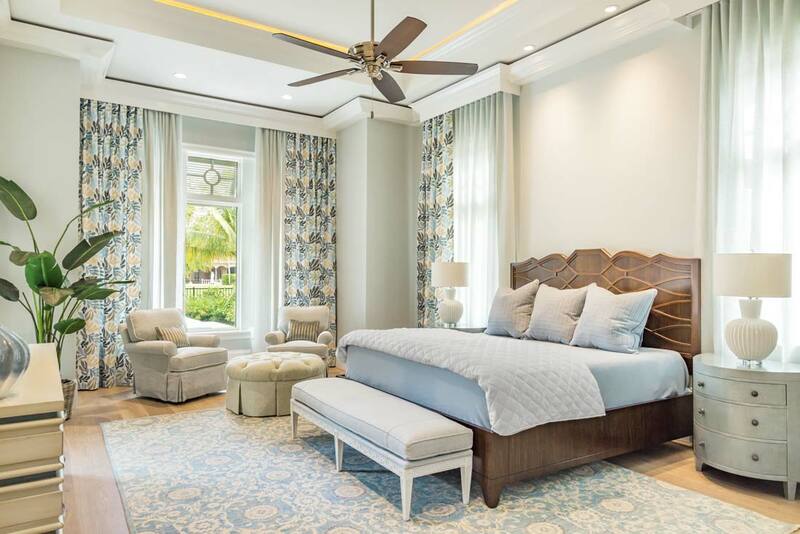 ABOVE: Soothing tones wash over the master suite, where Century’s bed with carved detailing sits among two Old Biscayne Designs’ chests in a pearlized ice blue finish and C.R. Laine’s bench sheathed in subtle blue and cream hues. The couple wanted a gathering space to enjoy Florida’s perfect year-round weather. And the loggia with its fireplace and outdoor kitchen that boasts a state-of-the-art Wolf grill provides just that and more. “This house feels like Florida should feel and has felt to me since I was a youngster,” says the husband in reference to his new home beautifully designed by Richardson to create new memories. BELOW: Bringing the interior color palette out to the loggia, several social groupings boast Summer Classics’ multi-toned striped Sunbrella-clad furnishings. The pool shimmers with the azure and deep cobalt blues of blown-glass mosaic tile.